Red snapper is a popular fish that is prepared, cooked and eaten in many different ways. Its popularity combined with many decades of unsustainable fishing and harvesting practices have depleted red snapper populations dramatically. For this reason, in addition to concerns about mercury levels in the fish, red snapper has become an environmentally unfriendly choice. In order to prevent further decimation of fish populations, the Environmental Defense Fund (EDF) and other organizations recommend that consumers choose alternative fish. There are several types of fish with healthy populations that are similar in taste and texture to red snapper that make excellent substitutions. Red snapper is a popular fish that is often cooked whole, baked or fried. It has a distinctive appearance with pearlescent red skin and red eyes. It is low in saturated fat, low in sodium and high in protein, so nutritionally it is a good type of food. Red snappers can live up to 50 years and grow as long as 3 feet. They inhabit the Gulf of Mexico and western Atlantic Ocean, and are harvested from marine fisheries using baited lines, not from fish farms. Fish labeled "red snapper" is often in fact other types of snapper. If a recipe calls for red snapper, it is entirely feasible to substitute any fish that is similar in taste and texture. Red snapper is categorized as an "Eco-Worst Choice" by the EDF, which recommend that you should avoid it or at least eat it infrequently until populations recover from overfishing. Although recent changes in quotas and other regulations have resulted in some improvement in red snapper populations, decades of overfishing have taken their toll and it will take many years until the fish is considered an eco-friendly choice. Gulf and South Atlantic red snapper populations are only at 3 percent to 5 percent of their target size, according to the National Oceanic and Atmospheric Administration. 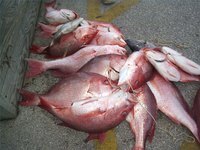 In addition to overfishing, there are several other factors that have damaged and continue to damage red snapper populations. Shrimp trawlers in the Gulf of Mexico take smaller, juvenile snappers as a bycatch. These discarded fish die, reducing the breeding population. Longline fishing methods used to catch red snapper are also harmful to seabirds, sea turtles and sharks. Personal health concerns are an additional factor to consider when choosing what fish to eat. If the environmental factors do not compel you to replace red snapper with other fish, consider the danger of consuming a fish with moderate to high mercury levels. Red snapper contains moderate levels of mercury, which poses a serious health risk to children in particular. The EDF recommends that children under 6 years old eat red snapper no more than twice a month; children 6 to 12 years old should eat it no more than three times a month. The EDF has compiled thorough information for consumers to help you make eco-friendly and healthy fish choices. You can print a "seafood selector" chart from its website, www.edf.org. While red snapper is designated as an Eco-Worst Choice, they suggest other similar tasting fish as "Eco Best" alternatives. Mahi mahi caught by troll or pole in the United States are fast growing and resistant to population decline. Farmed striped bass contains lower levels of contaminants than wild striped bass and are raised in a sustainable manner. Alaskan and Canadian-sourced sablefish also maintain healthy populations. Sablefish from California, Oregon or Washington are not as sustainable as those from Alaska or Canada but are considered "Eco-OK" by the EDF. Mutton snapper and yellowtail snapper are members of the same family as red snapper and are also categorized as "Eco-OK". They make better choices than red snapper and can be substituted successfully in any recipe.